Anglesey Lodge Equine Laboratory provides laboratory services to vets within our practice, and many of our referring vets. Thanks to all the crew in Glenbio for installing our new state of the art biochemistry machine. 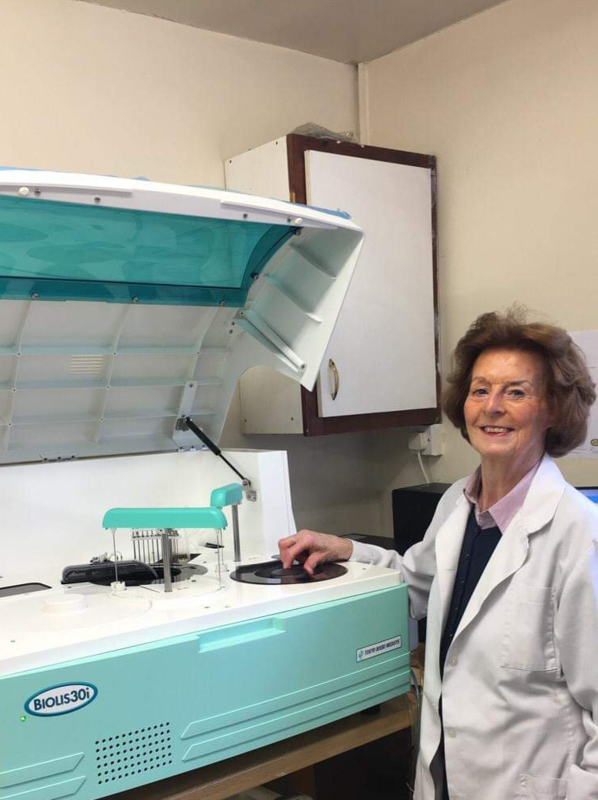 We process blood samples both for detection or monitoring of disease, and for assessment of racehorses in training and before declaration to race. (also called complete blood count (CBC) or full blood count (FBC)). The routine panel includes Total Protein, Albumin, Globulin, Bilirubin, Alkaline Phosphatase (SAP or ALP), Aspartate Aminotransferase (AST), Creatine Kinase (CPK or CK), gamma Glutamyl Transferase (GGT), Urea, Creatinine, Glucose, Calcium, Phosphorous, Sodium, Potassium and Chloride. This gives information on the electrolyte balance and immune system of the horse, and possible damage to the muscles (including tying-up), the liver and the kidneys. In addition to our routine panel, we are also able to offer measurement of magnesium (another electrolyte important for muscle and other functions), bile acids (a measure of liver function), triglycerides (increases with severe negative energy balance and hyperlipaemia) and lactate (increases in shock and dehydration). We also measure serum amyloid A (SAA), a very sensitive marker of acute inflammation and infection. Measures the IgG in the blood of newborn foals, to check that there has been adequate transfer of antibodies from the colostrum. If the IgG is not adequate, the foal is at greatly increased risk of infections. Measurement of this hormone can be useful in the investigation and management of the broodmare. We are able to culture and analyse samples taken from the horse for the presence of bacteria. If bacteria are cultured, we test them against a panel of antibiotics to determine which antibiotics may be useful in treatment of the horse. The laboratory is overseen by our full-time lab manager, Noreen Madden, Noreen is highly experienced in laboratory work. Her CV includes spells in Newmarket, Cornell and the State laboratory in Abbotstown.